It took me some time get used to it, I will admit. However, after getting under its nails, I dived in the vision of the burning mind of one guy named Mikey Wenzel, vocalist and multi-instrumentalist. It would appear that the artist, calling his project STARQUAKE, wished to have it all under the same platform, taking the listeners back to the obscure progressive and Hard Rocking of the 70’s while also tackling them with various of 80’s Traditional Metal blasts of the British kind mainly. Picturing a crude, somewhat realistic world, but still implacably imaginative, Wenzel, along with the amazing illustration pieces of Rodney Matthews (NAZARATH / MAGNUM / PRAYING MANTIS / SCORPIONS), portrayed the classic age of both Rock and Metal music. Under the veils of “Times That Matter”, signed to Pure Rock Records, vintage harmony came along dancing in the twilight, yet modernity wasn’t kept away and embarked upon a selection of stages for an additional crisp. Throughout the process of “Times That Matter”, you will notice the faces of Rock and Metal that apparently Wenzel took inspiration from. Whether sounds of vintage harmonized PINK FLOYD, SPOCK’S BEARD, URIAH HEEP, DEEP PURPLE, yet also the less manic and progressed NWOBHM and its captivating melodies, think early IRON MAIDEN. The flowing patterns in which the music links from crude straightforwardness of powerful Heavy Metal prowess to atmospheric Rock plunged in by Hammond organ made this release an interesting form of this unison. Furthermore, Wenzel composed what would appear as life stories, sights and echoes, partially seemed truthful and some as examples of courses of lives. Whether eposes or strong bolded hits, Wenzel knew how to maneuver and to create those pauses within eposes to add to the suspension. Deep down into the setlist, there were songs where I thought to myself that Wenzel may had went over the top or mainly appeared as if amateurish, especially numbers such as “Scenes From A Revolution”, “I'm Goin' Mad (You Comin'-)”, “Whatever” and “Fairytale”. However, after listening carefully, even to such a hackneyed stretched epos tune like “Fairytale” or the less inspired cheesy ballad “Whatever”, I perceived that is wasn’t actually bad, even without stinging anything inside. The aura was there and setting was all laid out. On the other hand, I believe that Wenzel and his studio mates proved that the true magnitude and essence of STARQUAKE was actually within its heavier tunes and continued mixture of both 70s and 80s, along with its chops of Modern sounding formats. “Here I Go Again” struck me with a kind of a surprise, a measure of a WHITESNAKE (not the cover) oriented delivery of Hard N’ Heavy fueled fire with amazing riffery and a too wild to tame attitude. The almost industrial “The Needle Lies” continued the great flow with its dopy sensation and the beautiful instrumental flavored “Goodbye My Friend” that aspired to the early 80’s masters. As for the “No More Hate”, at first at least it was hard for me to understand why Wenzel took the trouble to compose and record a mimic tune to IRON MAIDEN’s “Wasted Years”? Intentional or not, hard to say, yet it sounded that ok but I can’t really take a stand with this one due to its nature. “Rise And Fall” was a bit of a puzzle at first, quite a W.A.S.P. kind of copycat story of the musician that sold his soul for glory or you might even add in THE WHO’s “Tommy”, though it went down quite good with some fine musical elements and a few tremendous choruses. These kinds of eposes are almost extinct and I am glad that STARQUAKE shared such a nostalgic phase. Not overly mad or burning with impression, “Times That Matter” is yet another journey through the mind of a musician. 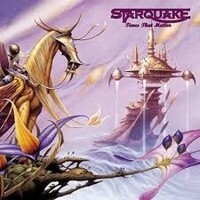 STARQUAKE is an act that should be surveyed as there is plenty of offer supporters of Rock and Metal of the early age.